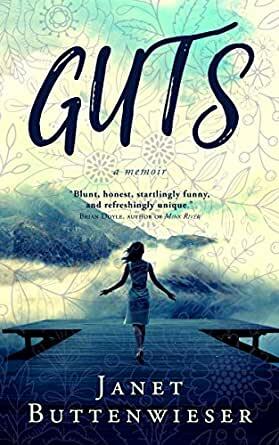 With themes that echo Susannah Cahalan’s 'Brain on Fire' and Gail Caldwell’s 'Let’s Take the Long Way Home', GUTS is a story of resilience for the millions of Americans who manage to thrive while living with a chronic condition, as well as the many who’ve lost a loved one at a young age. Beautifully written and riveting personal account of one woman’s drive to thrive, not just survive, despite some of the most challenging issues we face as human beings: serious chronic illness, infertility, loss, and grief. Not to mention grueling triathelons! Uncommonly candid, brave, poignant, and funny, with insightful introspection and inspiration throughout, Guts is a page-turner from start to finish. Surprisingly, I read the book in just two days over a holiday weekend with my husband and kids chomping at the bit for outings and activities. A rare achievement for a busy wife and mother without a lot of time to read! This memoir is hard to put down, and impossible to forget. I find myself thinking about the people and events long after I finished the book. What would it be like to live with a permanent colostomy? How is parenting going for Janet and Matt as their children age? How are Beth’s family and her husband Kevin doing? Will there be a sequel? These and many other questions swirl around in my mind daily since closing the book earlier this week. Thanks to Janet for sharing her amazing and moving story with us! Her strength of mind, body, and spirit is palpable. She has guts—and then some! 5.0 out of 5 starsA breathtaking journey through friendship, family, loss, and courage. Guts reveals one woman's inner journey through illness, friendship, recovery, grief, and joy. It's evident that Buttenweiser has grown through some heartbreaking losses, and her honest reflections inspired and moved me. Her smart, yet tender, wit softened the sadness and poignantly portrayed the deep connections among the characters. The perspective from a patient makes this a must-read for health professionals. Tri-athletes, people with fertility struggles, and anyone who's ever lost a friend or struggled to stand up and be heard will be strengthened by the author's "guts" to tell a challenging story with beauty and grace. This is a poignant memoir of two women going through serious illness--the author and her best friend. The author, Janet Buttenwieser, was healed after a last-resort colostomy, and Janet went on to raise children and regain strength. Her friend, whom Janet had always viewed as the more "powerful" one, died of brain cancer. This book explores the pain and frustration of illness, the guilt of being a survivor, and the lonely process of grief. The book is deeply human and reflective, without self-pity, anger or sentimentality. I especially recommend this book for people who face grave illness at a younger point in life than when these things are "supposed" to happen. What I loved most in this beautiful memoir were the author’s honest and heartfelt reflections, as she navigates through debilitating illness, struggles to become a parent, the challenges of triathlon competition, and the death of a beloved friend. She is able to interrogate the tumultuous events of her life and extract wisdom from them to pass onto the reader. An inspiring and touching book. This story speaks to everyone because everyone has experienced loss. Janet expresses her story from health to illness to recovery, and from shyness to strength and courage in engaging prose while also revealing the journey of her relationship with Beth . This book was so inspiring g and tripping I couldn't put it down.